The United States Mint on Wednesday introduced newly designed 2009 Presidential $1 coins and released detailed artist images of the dollars. 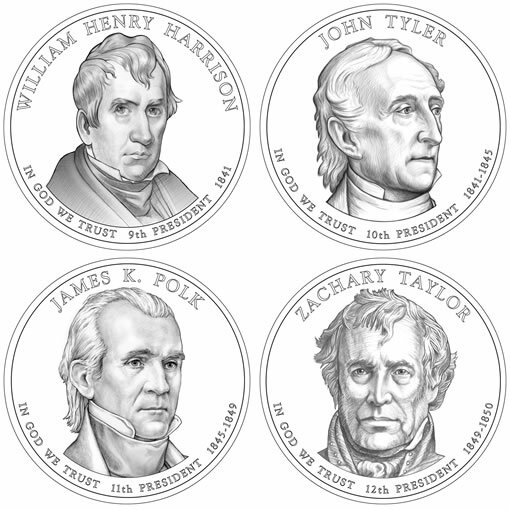 The American public will see 2009 circulating coins honoring Presidents William Henry Harrison, John Tyler, James K. Polk and Zachary Taylor. Most interestingly, different design elements have been implemented compared to the initial series of 2007 and 2008 coins. Notable in the new designs is the placement of "In God We Trust," which in past years has been on the edge of each Presidential dollar. A public outcry occurred when the U.S. Mint inadvertently issued a small subset of 2007 dollars that did not have the inscription because of minting errors. Also, while many thought edge letterings on coins would be a fresh approach, fewer liked "In God We Trust" there after seeing the new dollars. They felt the inscription lacked prominence, and needed to be moved. Congress acted and a new law was passed in late 2007 that empowered the Mint to move "In God We Trust" to the obverse, or heads side of each coin. The law was too late to affect already designed 2008 Presidential dollars, making 2009 the banner year for change. In further improvements, where currently there are single dots (delimiters) between the edge inscriptions, in 2009 there will be three stars between "E Pluribus Unum" and the mint mark and 10 stars between the year of minting and "E Pluribus Unum." “We hope Americans not only appreciate the aesthetic qualities of the Presidential $1 Coins, but also remember each President’s legacy every time they use the coins in their daily transactions,” said United States Mint Director Ed Moy. The first Presidential $1 Coin of 2009, struck in honor of our ninth President, William Henry Harrison, bears an image sculpted and designed by United States Mint Sculptor-Engraver Joseph Menna. The second Presidential $1 Coin of 2009, honoring John Tyler, our Nation’s 10th President, bears an image designed and sculpted by United States Mint Sculptor-Engraver Phebe Hemphill. The third coin, honoring the 11th President, James K. Polk, features an obverse portrait designed by United States Mint Artistic Infusion Program Master Designer Susan Gamble and sculpted by United States Mint Sculptor-Engraver Charles Vickers. The fourth coin, honoring Zachary Taylor, our 12th President, features an obverse portrait by United States Mint Sculptor-Engraver Don Everhart. The reverse design on all Presidential dollars features a rendition of the Statue of Liberty, designed and sculpted by United States Mint Sculptor-Engraver Don Everhart. I think Proofs should stay the same. I am so pleased that In God We Trust will be on the face of the coin instead of edged on the side where it would have easily disappeared over time…Thanks to the many who boycotted this and showed their faith in God the Almighty One. This nation was founded on Christian principals and we must never forget that God is in control….God Bless America! Lisa I agree with you and your comments on the new dollars. Thanks for your comments. Will the 2009 dollar coins be minted in P&D versions or will there be just one version. said “New World Order” and did not have ‘IN GOD WE TRUST’ on it. Was this a joke or is there such a coin being minted??? Does it matter which side the inscription faces on new $1 coins? ex: when reading side inscript. should Pres. head face up, or down? Is the date location in the same place on each coin? Joan Welsh – PLEASE take the time to do some research before believing every internet rumor that comes over your screen. YES IT’S A HOAX! Just another crazy stunt designed to get people worked into a frenzy over symbolism instead of relying on facts. New Inscription – The coins are put through the lettering machine randomly. About half will face towards the obverse and half towards the reverse. There’s no “right” or “wrong”, just chance. Richard Kupkee – The coins will carry mint marks on the edges, just like the Presidential dollars. All coins except cents have had mint marks since 1980, and non-Phila. coins had mint marks long before that. There seems to be a couple of mistakes I found. The 1st mistake was between the edges of the 2009 United States one dollar coin. I have a number of those coins and there is the words (E Pluribus Unum)going in reverse on one of my coins. The second mistake I found was when I tried lining up the heads of Zachary Taylor with the others, one head of my coins is counter clock from all the rest. Let me know what you think about these coins I have. Thanks!